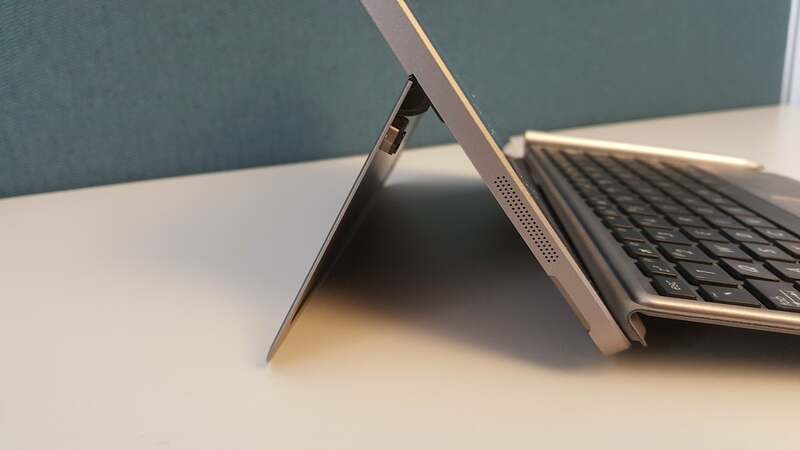 Just manage your expectations for this affordable Surface clone. Buying a cheaper Windows tablet always means answering the same question: Can I do as much as I want while still paying less? 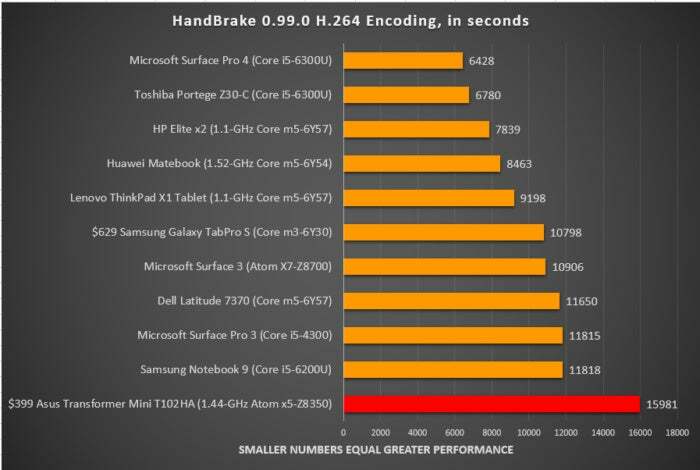 In the case of the $399 Asus Transformer Mini (T102HA), the answer is yes, but just barely. 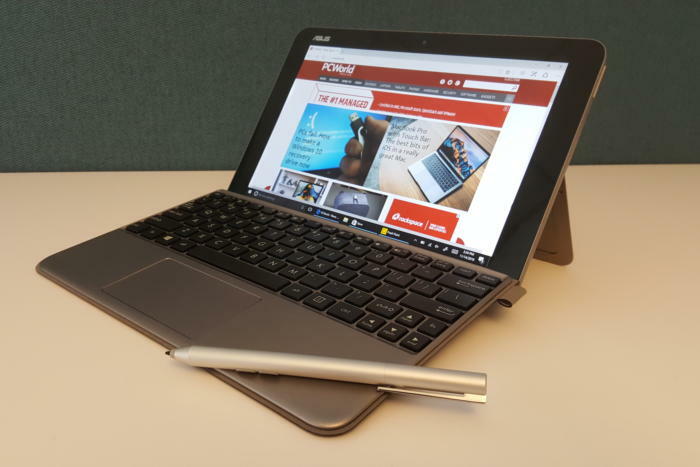 Your first impression of the Mini will almost certainly be of an updated Microsoft Surface 3 (now discontinued), with a redesigned, sturdy keyboard and a stylus to boot. But that image is only skin-deep. Inside its thoughtfully designed exterior lies a number of mediocre components. It’s like buying a shiny Red Delicious apple at a supermarket. What’s inside isn’t usually the crisp, sweet crunch you'd hoped for. 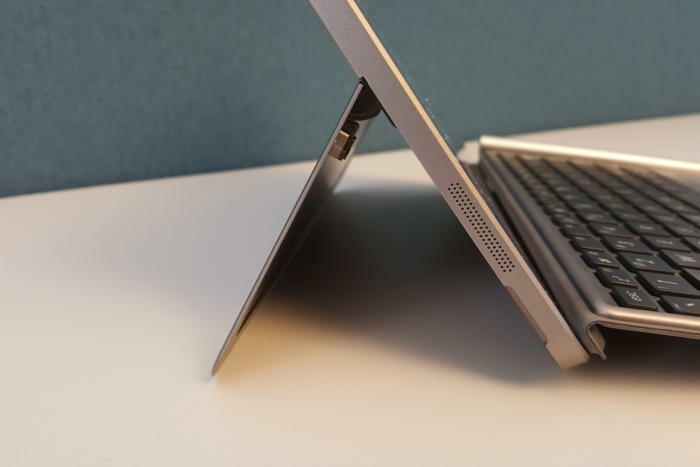 For desktop use, the Mini’s Surface-like kickstand suffices just fine. But let’s start with the positives. Asus clearly followed where Microsoft led: While the Mini adopts the same compact form factor of the Surface 3, the faux fabric backing the keyboard probably will remind you of the Surface Pro 4. The Mini measures 10.2 inches by 6.7 inches by 0.55 inches (13.9 mm) in laptop mode, and weighs a scant 1.74 pounds with the tablet and keyboard together. Asus claims that the tablet is made of a magnesium-aluminum alloy. The silvery material is both light and rigid. 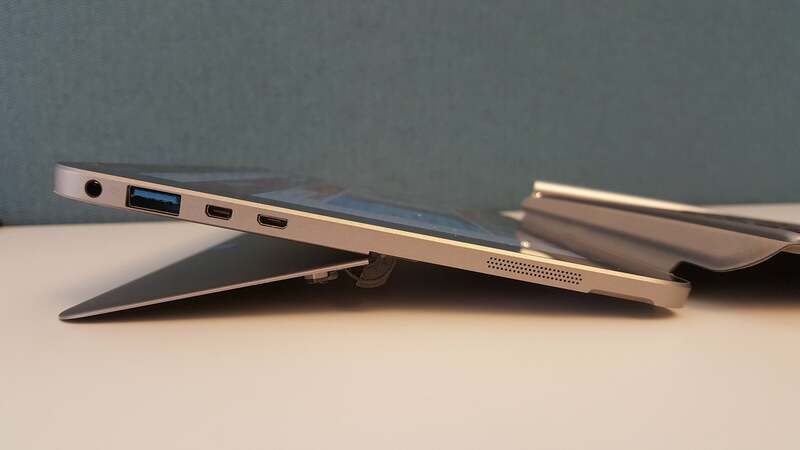 On the rear of the tablet hides the expected kickstand, a Surface-like hinge that folds out midway down. The hinge sturdily supports the Mini across its full range of motion, with no discernible wobble. If you’d like to fold the kickstand further, it will recline the tablet to about 25 degrees, among the flattest we’ve seen. In all, it’s a great degree of freedom for such an inexpensive device. You may not want to recline the Asus Transformer Mini this far back, but it’s there if you need it. Note the USB, charging, and mini-HDMI ports too. 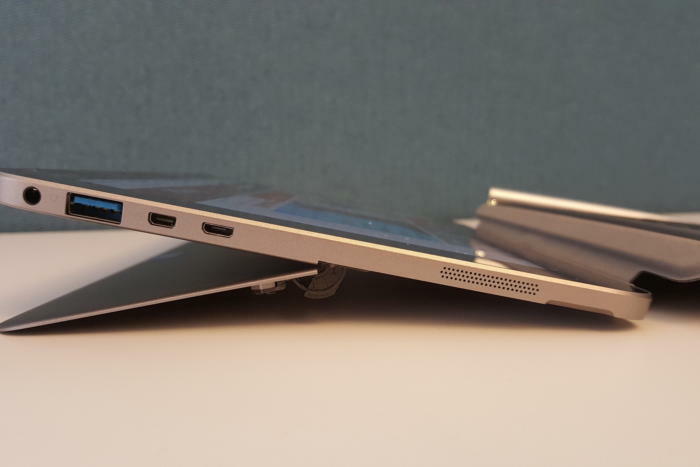 Unlike the Surface tablets, Asus doesn’t bury the Mini’s SD card slot under the hinge. Instead, a USB 3.0 connector, mini-HDMI connector, micro-USB charging connector and the microSD card slot (up to 512GB) are all mounted along the edge of the tablet. Asus clearly couldn’t budget in the type of front-facing depth camera that Microsoft embedded into its Surface lineup. 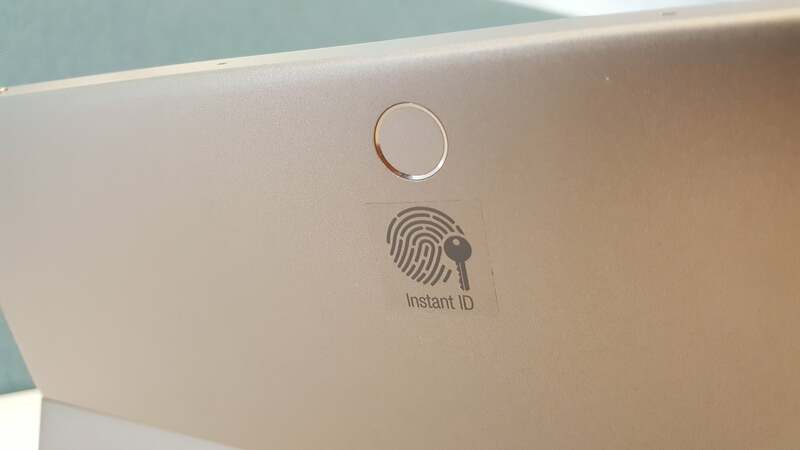 Instead, Asus chose an inexpensive 2MP front-facing camera and mounted a decent fingerprint sensor on the back of the tablet. Fingerprint sensors sometimes require a bit of futzing, especially if there’s a rear-mounted camera lens that your finger may swipe instead. Asus does well here: A tiny ridge helps guide your finger where it needs to go, and the sensor is quick and usually accurate. 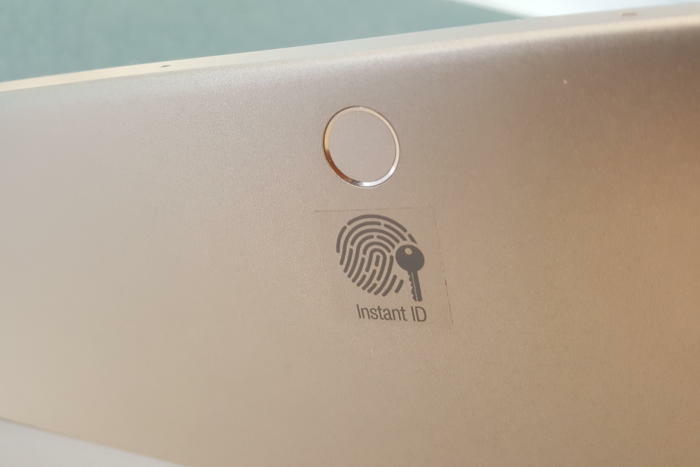 The Transformer Mini’s fingerprint sensor is pretty accurate, though you may need to tap or slide your finger once or twice to properly register. Asus says it redesigned its keyboard for the Mini—offering improvements over the Asus ZenBook 3, apparently. My initial reaction was that the 10-inch form factor crammed everything together a bit closer than I’d like, especially on the left-hand side. To the right, however, are generous landing pads for the Enter and Backspace keys. I’d also prefer the space bar to be a bit larger. If you have large hands or thick fingers, you may find the Mini’s keyboard rather cramped. Over time, though, I warmed to it a bit more. 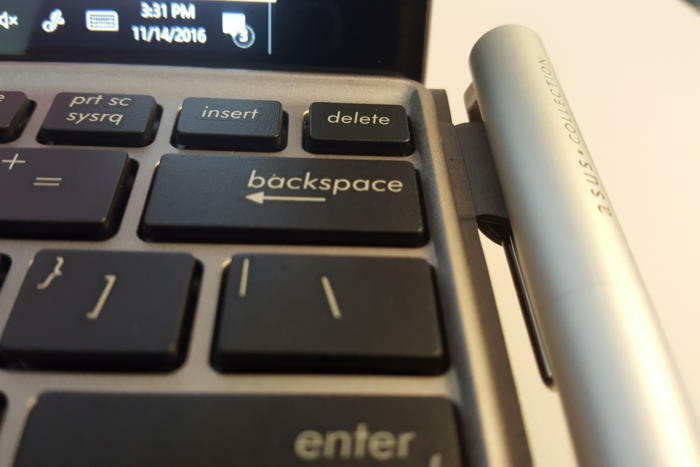 The 1.5mm key travel proved relatively comfortable, and each key was stiff enough to rest my fingers upon without triggering a keystroke, helping eliminate fatigue. It’s no laptop, but a lack of keyboard flex and decent key travel helps the Mini’s keyboard make a good first impression. Over time, though, the weak magnetic connection grows annoying. 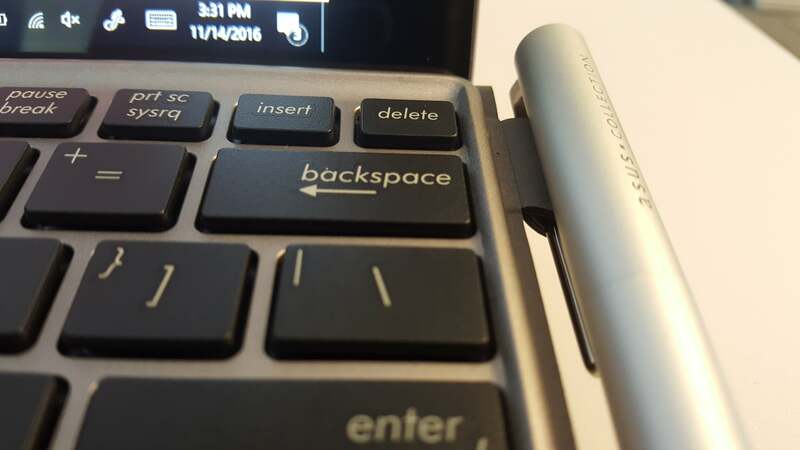 Though the trackpad may seem small, my thumbs glided smoothly over it, and clicks and gestures were recognized well. I didn’t notice any keyboard flex, either while using the trackpad or jamming my fingers down on various keys. 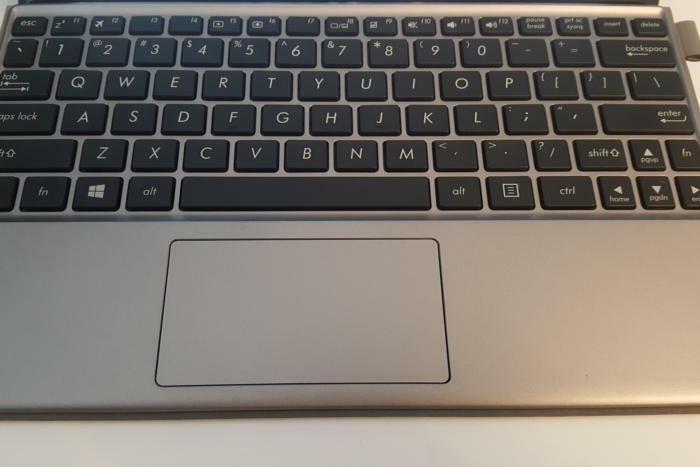 My chief complaint with the Mini’s keyboard, however, is how easily it separates from the tablet itself. 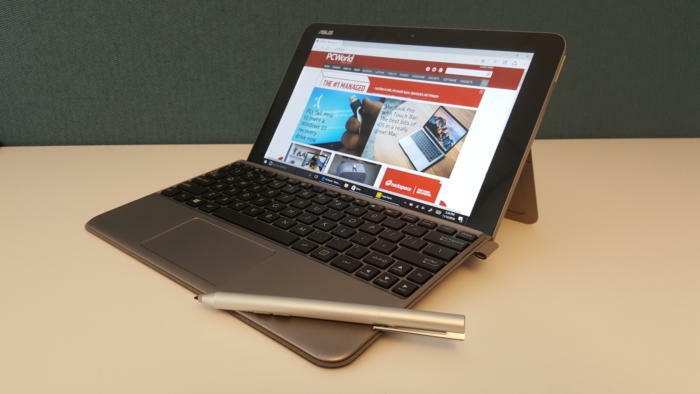 Like rival tablets, the Mini uses a folding hinge that first connects the keyboard and its pogo pins to the tablet to establish a connection, then connects along a magnetic strip for added typing stability. It’s this strip that detaches too easily, often jarring the keyboard connection loose and prompting Windows to switch to tablet mode. As a result, working with the Mini on your lap can be a rather delicate proposition. The Mini securely stashes its stylus via a pen loop and a clip. I was unreasonably pleased to find that the Transformer Mini incorporated one of the best features of the Surface 3, however: the pen loop. This smaller loop only allows the included stylus to attach via its pocket clip, but it's a nice convenience, and it feels securely attached to the tablet's right side. 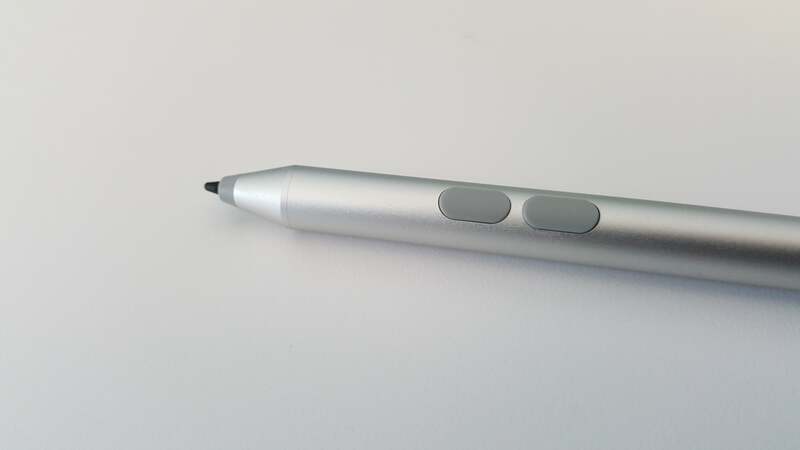 The two-button pen generates 1,024 levels of pressure but is otherwise unremarkable, and lacks any sort of virtual eraser at the end of the pen. Just remember to remove the small black cap on the AAAA battery inside the pen before using it, or it won’t work. 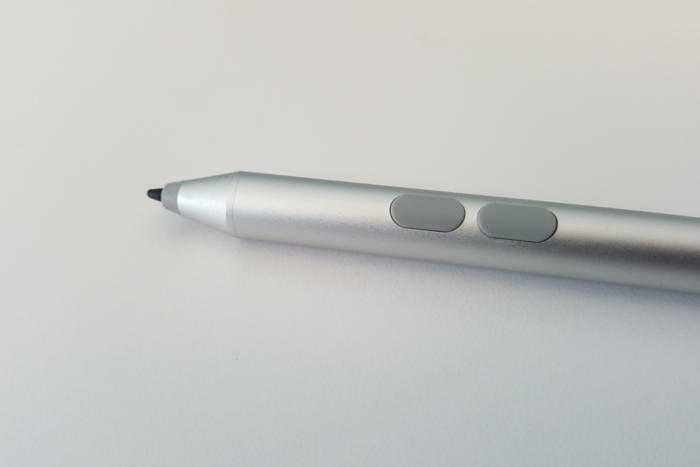 The Mini’s stylus is unremarkable, but at least the pen loop makes it hard to lose. Inside the tablet itself, the Asus Transformer Mini is a step down from the older Surface 3. 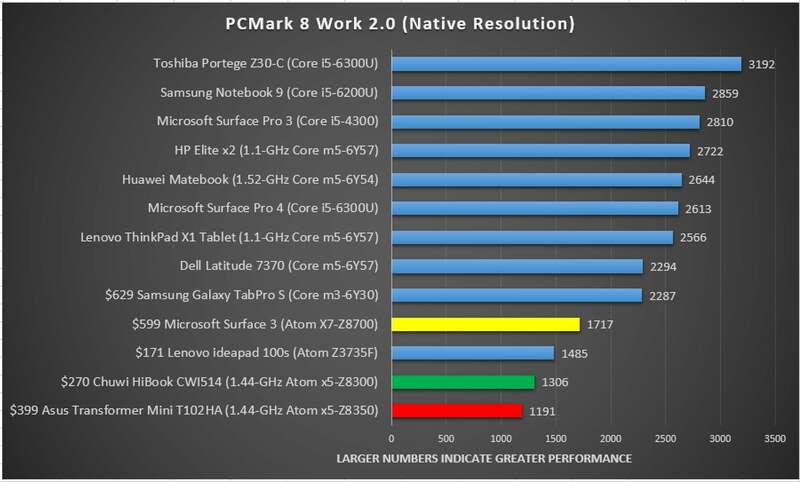 While the Surface 3 included a 1.66GHz Atom x7-Z8700 chip, the Mini has a 1.44GHz Atom x5-Z8350. (Both are members of the same 14nm “Cherry Trail” Atom generation—you can compare the two here. Note that while ARK indicates that the chip can only address 2GB of memory, that appears to be an error.) The Mini uses a 64-bit version of Windows 10 Home. Otherwise, the Mini’s specs are equally bare-bones. Credit Asus with a bright, 400-nit (rated) 10.1-inch display, but the 1280x800 touchscreen just barely reveals individual pixels—and is way, way down from 1920x1280 offered by the the 10.8-inch Surface 3. The fact that the Mini can’t even deliver 1080p—and a competing product, the $210 10.1-inch Chuwi HiBook, can—may turn you off. However, this screen resolution is pretty common for most other tablets at a similar price point. Fortunately, the Mini at least includes 128GB of eMMC storage inside it, though its transfer speeds are poky: about 140MBps reading data, and 68 MBps writing. 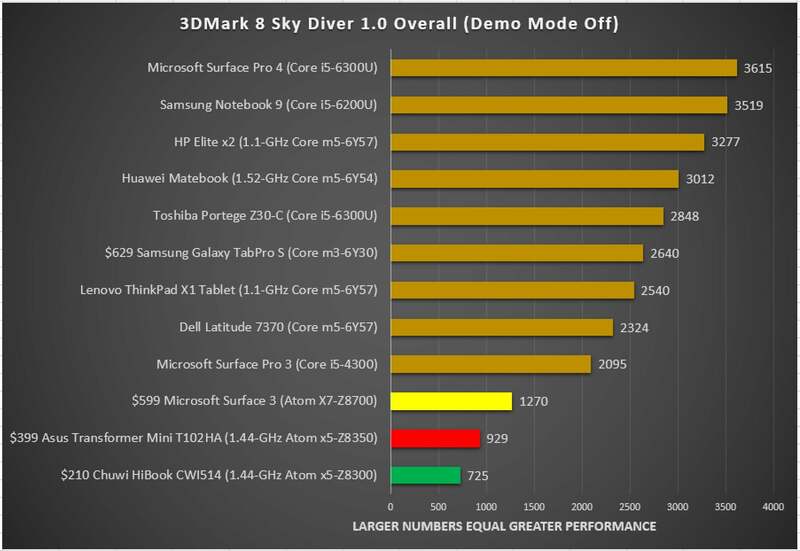 That’s a bit slower than the original Surface 3, a bit faster than the HiBook, and about half the speed of a SATA 6GBps SSD. The Mini’s speakers aren’t really anything to write home about, either, though they’re loud. There’s a nice little app for adjusting the audio properties for watching a movie or playing a game. It’s not quite an audio equalizer, but it’s something. I also had no issues connecting the tablet via either its integrated 802.11ac Wi-Fi or Bluetooth 4.1. The Asus Transformer Mini works well as a cheap, on-the-go tablet. I was ready to call the Transformer Mini’s performance a deal-breaker, but that’s not quite true. In our series of benchmarks tests, the Mini fell to the bottom of the stack, yes. But I spent some time web-browsing, playing Netflix and YouTube, and digging through a Flash site or two. Beyond eight or so tabs in Edge, performance begins to deteriorate. 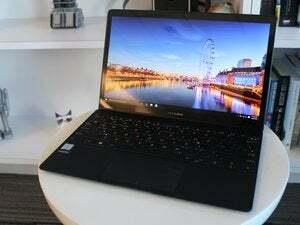 But as long as you consider the Mini to be a single-purpose machine, you can watch video, use some of Microsoft’s Office Online apps, or surf the Web just fine. Even Minecraft’s UWP Windows 10 app ran surprisingly smoothly. In standardized benchmarks, though, things differed. You’re going to see a theme here: bottom-of-the-barrel performance. Honestly, a Cherry Trail Atom chip is about the slowest you’ll find in the market today, falling way behind even the low-end Core m series. The key metrics here are most likely the PCMark benchmarks, measuring typical office use (Work), some light web browsing and graphics (Home), and some image and video editing (Creative). On the Work portion of the test, the Mini underperfomed both the Surface 3 and the Chuwi HiBook—and I felt that the HiBook wasn’t really fast enough to serve as a daily driver. Just for fun, we’ve included some of the prices of other competing tablets, so that you can better evaluate the performance for the price. 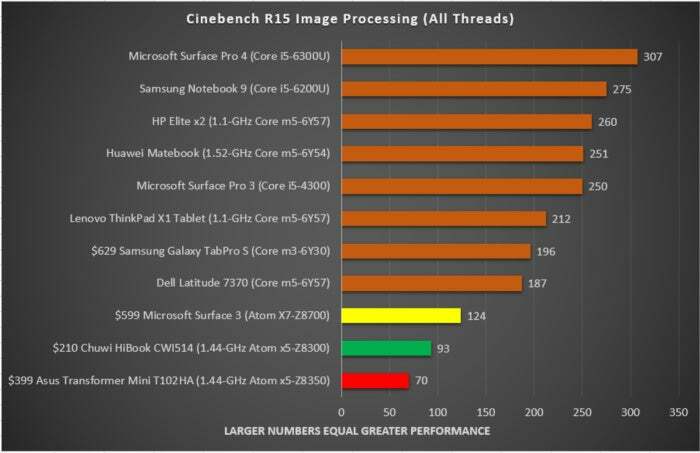 We stress-tested the Atom CPU using our CineBench R15 rendering test, which asks the CPU to render a 3D scene, as well as HandBrake, which stresses the CPU via video encoding. (We throw a 30GB MKV file into Handbrake and convert it to an MP4 using the application’s Android Tablet preset.) Though the Mini’s performance struggled, at least I couldn’t detect any thermal throttling, and the tablet remained cool. Inside the tablet is a 32 watt-hour lithium-polymer battery, powered by a micro-USB cord (just like the Surface 3). And you’re stuck with it, too: Unlike modern smartphones, there’s no quick-charging option here, so expect to charge the Mini for several hours if the battery runs down. Fortunately, Asus more than makes up for it with true all-day battery life. When we looped our 4K test video (which rendered at only 1280x800, natch) in Windows 10’s Movies & TV app, the Mini lasted 9 hours, 43 minutes (583 minutes). That’s probably due to its low-res screen, but the Mini still obliterates recent battery test results for the HiBook (279 minutes), Huawei Matebook (333 minutes), HP Spectre x2 (375 minutes) and others. You can say one thing for the Intel Atom chips: Their standby time is usually very good, and a quick tap of the power button flashes an Asus battery gauge that gives you an idea of the remaining battery life without needing to boot the tablet. That’s a nice little feature I wish other tablets had. Achieving a $399 price point doesn’t come without making some tough decisions about what components and features to include. 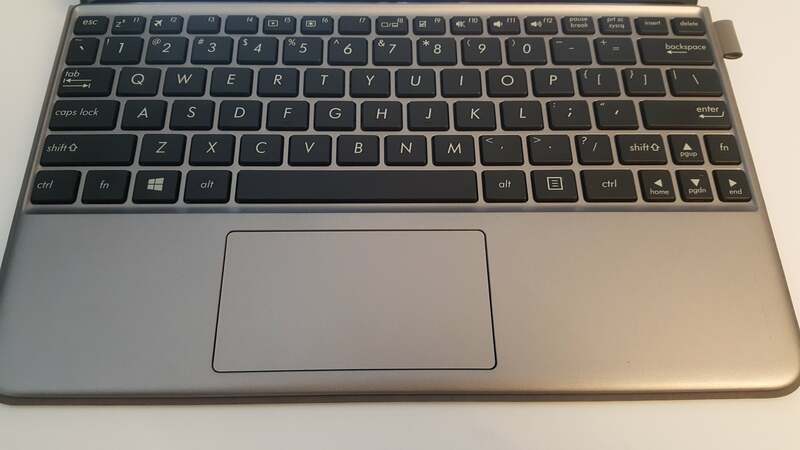 With the Asus Transformer Mini, Asus includes necessary accessories like the keyboard cover, but cut some corners when it comes to hardware: the basic processor, sluggish flash, and low-res display. You can, of course, do better by paying more for a competing tablet. 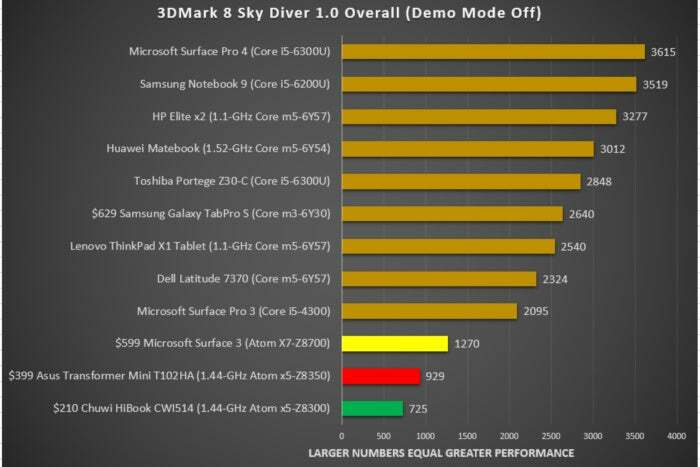 Personally, I prefer the flexibility of a Core m-powered tablet. The Asus Transformer Mini is a compact two-in-one priced cheaply enough to make some of its issues, such as anemic performance, forgivable.